Or, Why Should I Listen to Jeff and Allison? We have been traveling to the ABCs since 1993. Some years, we visited the islands more than once. Most years, we traveled to Aruba as part of the Ageless Jazz Band, performing at resorts in the evenings during extended visits, Jeff as lead trumpet player, Allison as vocalist. While their bandmates hit the casinos or other nightlife, we hit the sack to get as much rest as possible so we could rise early for some great birding the next day. After getting a taste for Aruba, we island-hopped to Bonaire (an easy trip) during Ageless Jazz Band days off. 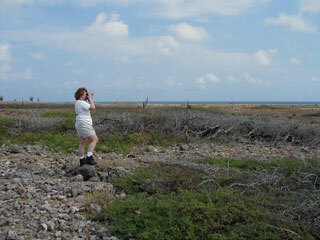 Since then, we've made birding forays to Bonaire, with several visits to Curaçao as well. Jeff has a Ph.D. in ornithology from Cornell University and is currently senior scientist for the Boreal Songbird Initiative, a nonprofit organization working toward the conservation of North America's last great wilderness—the Boreal Forest. Prior to that, he was a conservation ornithologist at the Cornell Lab of Ornithology and was also the bird conservation director for the National Audubon Society. He is the author of the book, Important Bird Areas in New York State and co-author with Allison of Birds of Sapsucker Woods. He has authored many scientific publications and has nearly completed a book on the conservation of North American birds. He spent many years as a field researcher in southern Maine , where he was frequently assisted by Allison, who is the public affairs and marketing director for the Natural Resources Council of Maine, a membership organization protecting the health of Maine 's people and environment. Before that, she served as communications and marketing director for the Cornell Lab of Ornithology. 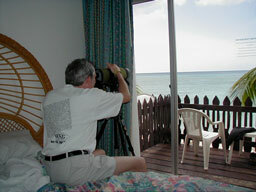 She is the author of hundreds of articles and has contributed widely to various books about birds and birding. Both Jeff and Allison are lifelong birders, and both are Maine natives who now make their home in Gardiner , Maine , with their young son (whose first word was néné—Hawaiian Goose) and two bird-loving indoor cats . 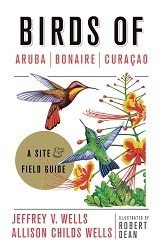 To see a list of some of the papers Jeff and Allison have published on birds of Aruba, Bonaire, and Curaçao click here.